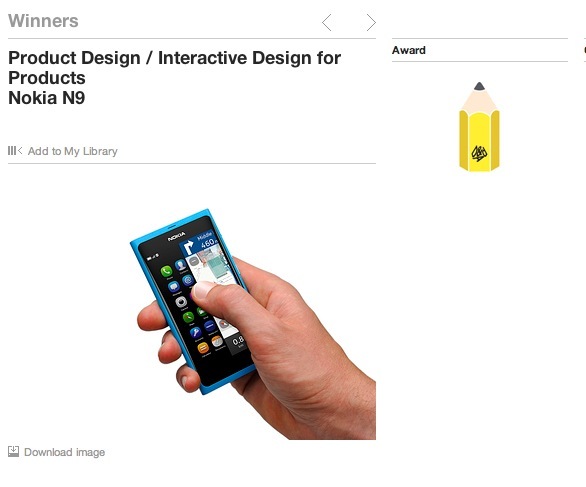 Nokia N9 wins Design and Art Direction award; coveted Yellow Pencil for interactive design. The Nokia N9 has achieved a Design and Art Direction award. It was actually nominated in two categories, recognised in product design and interactive design for products. The first category was actually won by a swanky chair. The second category, the N9 wins the coveted ‘yellow pencil’ which are ‘recognised the world over as a symbol of true creative achievement.’ This is for the innovative new swipe interface; gesture based swiping that does away with physical or virtual buttons on the homescreen. The successful design in the N9 has been praised in the 800 and 900, with several competitors now producing similar designs themselves trying to get some of that colourful, bold, polycarbonate action with curved screens. Prasenjit Singh Bist for the tip!